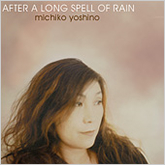 Michiko Yoshino's first recording in seventeen years is a soft, mature and lyrical vocal session. Recorded in a small town in Sweden, Yoshino's vocals are well-framed by a cool, sleek and delicate backing. Starting out with the lovely ballad, "Invitation," Yoshino sets the mood for a series of unhurried, confident, and well-chosen pieces. "Falando de Amor," (sung in Portuguese), "Round Midnight," "Blame It on My Youth," and "Waltz for Debby" are all soft, reflective pieces that fit Yoshino's singing style well. Her voice is husky and strong, with a flow of air like a lightly played sax. She has a somewhat limited range, but uses it well. Rather than forcing her voice to move high and low, she lets it swing calmly through the middle range of phrasing where she has the most control. She never over-reaches for too much, but gets it anyway. Her voice conveys a world-weariness that is unafraid to expose her vulnerability. It has a strength in its weakness, one might say. After the classic tunes, though, Yoshino goes into four originals which are sung without words. These four tunes are especially ethereal and haunting. She lets her voice move like an instrument, unimpeded by the necessity to articulate words from any language. The calm, deep power of these songs show a distinctly European sensibility--sophisticated, individual and complex. While their not fitting exactly into neat jazz categories may disturb some jazz listeners, they are lovely vocal performances that move outside typical jazz singing in their search for expression. Hopefully, Yoshino will be recording and performing more soon. You can buy the CD at these shops. Or, E-mail. Please write your name, address, product number, and amount.